Although the Lenovo K320t((A)s large display and robust battery (We'll discuss those pros later) make it sound like a tolerable low-budget phablet right off the bat, some of its cons might be huge turn-offs for some wide-screen smartphone shoppers. Its most-problematic feature comes in the form of a basic Spreadtrum 9850K quad-core 1.3GHz processor , which feels awkward, coming from a phone that came out in the first quarter of 2018 -- right around the same time when eight-core chips have trickled down to the entry-level market segment. Its 2GB RAM capacity feels underwhelming as well, especially considering its relatively-large 5.7-inch display. As for its positive specs, the K320t's aforementioned 5.7-inch screen features an expansive 18:9 aspect ratio , which we have observed on some models in our list of the best phablets as well. That being said, its uncommon (as of its release) aspect ratio feels a bit wasted, since it settles for a low-key (by phablet standards) 1440 x 720 HD+ screen that stutters in comparison to the 1080p and 1440p definitions boasted by some similarly-sized models. While it's unlikely to join our list of the hottest photography phones, the K320t does get ahead many of its budget-tier rivals imaging-wise by sporting a dual rear camera made up of an 8-megapixel primary cam for standard RGB photography and a 2-megapixel deputy cam for depth-of-field analysis. A standard LED flash and autofocus are on board as well. Up front, it sports an 8-megapixel camera that edges out some of its rivals' 5-megapixel-only selfie cams, at least when it comes to raw pixel resolution. For stamina, knowing that most smartphones with entry-level quad-core processors peaked at around 2400mAh of power only as we were reviewing the K320t's pros and cons, we flagged its robust 3000mAh battery as a selling point. On the contrary, we find it hard to say nice things about its 16GB internal storage , seeing that a good number of its contemporaries start off with 32GB of memories, but at least it comes with support for up to 128GB of top-up space. A couple more of its pros and cons include a rear-mounted fingerprint scanner and a polycarbonate housing that speaks to its low-end processing power. Standard 4G LTE connectivity also joins in. It runs Android 7.0 Nougat out of the box and is only available in what Lenovo calls Starry Night Black. 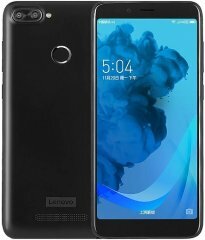 Long story short: The Lenovo K320t fits the bill as an introductory smartphone for users who don't mind sub-standard hardware components if it meant getting a big display and a taste of dual camera photography.